It’s been a while since my last post, but I didn’t give up JavaFX coding! Here is a little update on this Stage decoration library, this time focused on a new theme named “Touch” with large icons, and with some minor bug fixes. The executable jar to test: here! Enjoy, feel free to comment! 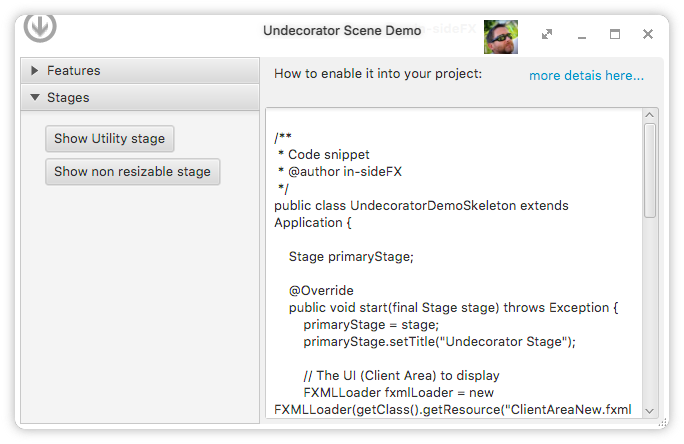 MagniFiX is a (very) small example illustrating the JavaFX transparent stage (Undecorator). If you’re interested, here are the Sources and, of course, the executable DemoJar to play with it! 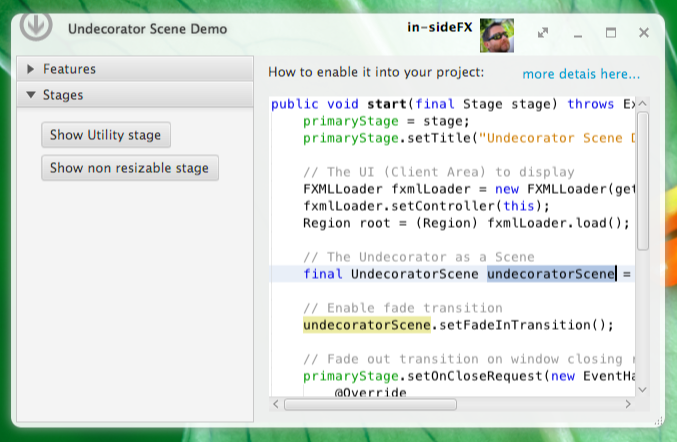 A new version of my JavaFX window decoration API. This time focused on the transparency and non-rectangular window. Jar is here and sources are available on GitHub. 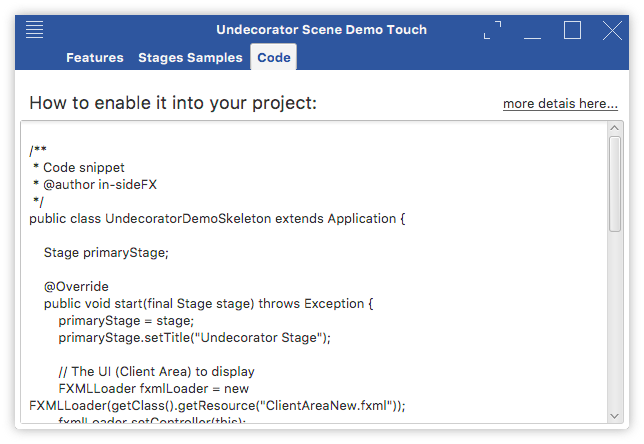 Look at demoapp/UndecoratorSceneDemo.java for this sample. ThreeDOM is dead, long live to ThreeDOM in ScenicView! In my previous post I presented a new kind of 3D visualization for 2D GUI called ThreeDOM. The bad news is that I’ll stop working on it 😦 Ooooohhhh…as a standalone jar! The good news is that it’s now part of the great ScenicView tool ! Announced last JavaOne by Jonathan Giles, ScenicView is now open sourced and so, this is my humble contribution to this project. Have fun with it, and send me your feedbacks and enhancements requests or directly contribute here: https://bitbucket.org/scenicview/scenic-view ! ThreeDOM: SceneBuilder in liberty and in 3D! As a first project to learn JavaFX 3D APIs, I’ve chosen to implement this fancy feature, inspired from FireFox. So, please welcome, ThreeDOM, the 3D viewer of flat 2D user interfaces! Use 3D when 2D reaches its limits! ThreeDOM creates a 3D representation of a 2D Node hierarchy, using textured Box nodes. It supports 3D rotation, translation and throws mouse events that can be handled by the host application. Easily grab “hidden” components to edit them. I’ll post the code soon, so you will be able to play with it. Have a great Summer FX! 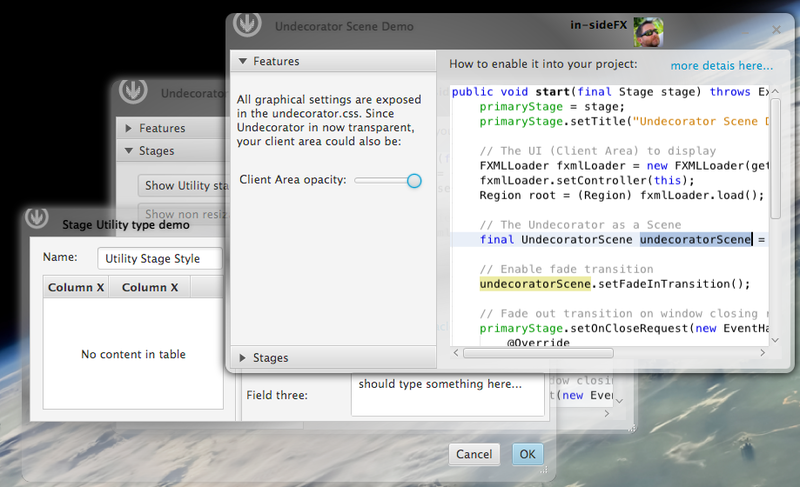 Little update to make Undecorator running on Java 8. Lesson learnt: Panes are now opaque (Modena?). Jar is here and works for both Java7 and Java8. Sources have been updated on GitHub. 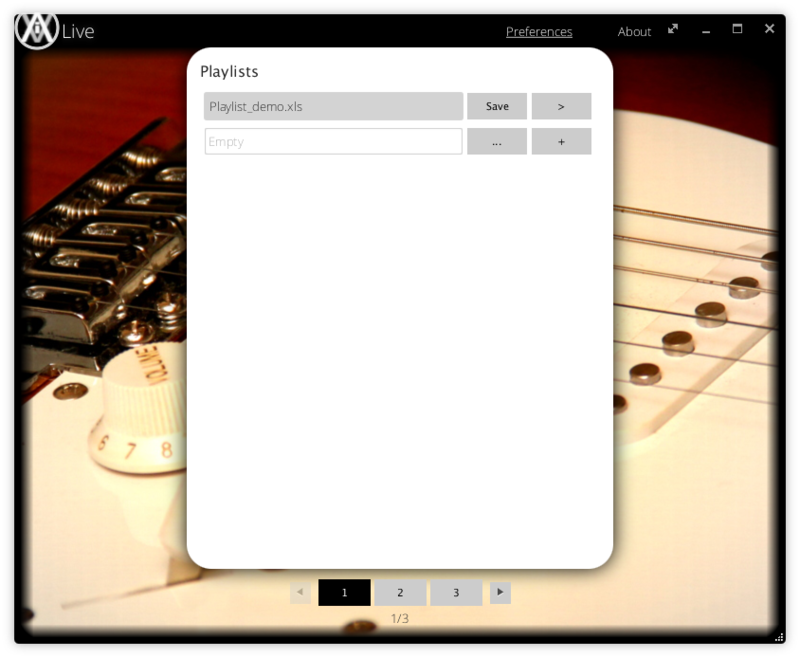 aLive is a free playlist manager software written in JavaFX. It’s an application I wrote (in my free time :)) to help music bands to organize rehearsals. As musicians, we often need to know, “Who’s playing on what?”, ”Where are the tabs, the lyrics…?”,“What is the total length of the playlist” etc… The basic aim is to simplify the presentation of classical playlists that are usually described in an Excel file. 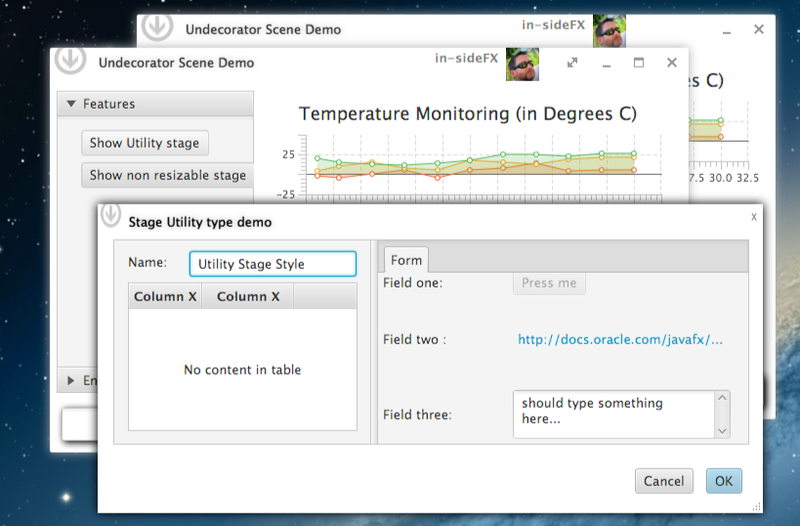 In addition, I took the opportunity to include fancy features provided by the Java/JavaFX platforms. I also reuse my two previous project Undecorator and iBreed. Current version is delivered as native installers for Mac and Windows (I don’t have Linux distrib on my computer). Now, Feel free to test it even if you’re not familiar with musical activities :-). The data source of a playlist is currently an Excel file (xls or xlsx). 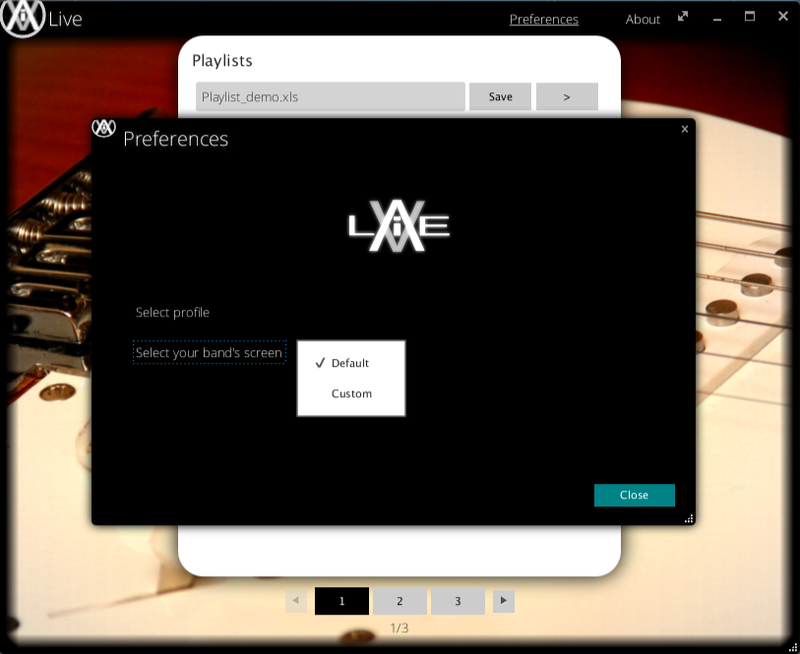 A built-in playlist is provided for demo purpose. Once your playlist opened, you access to all songs of the playlist and you can modify them. This file could be local or downloaded from an URL (read only mode). This screen displays all songs with their respective order, length and color syntax from original excel file. You can filter the songs list by keywords (title, key, who plays on it…). You also can add and remove songs. 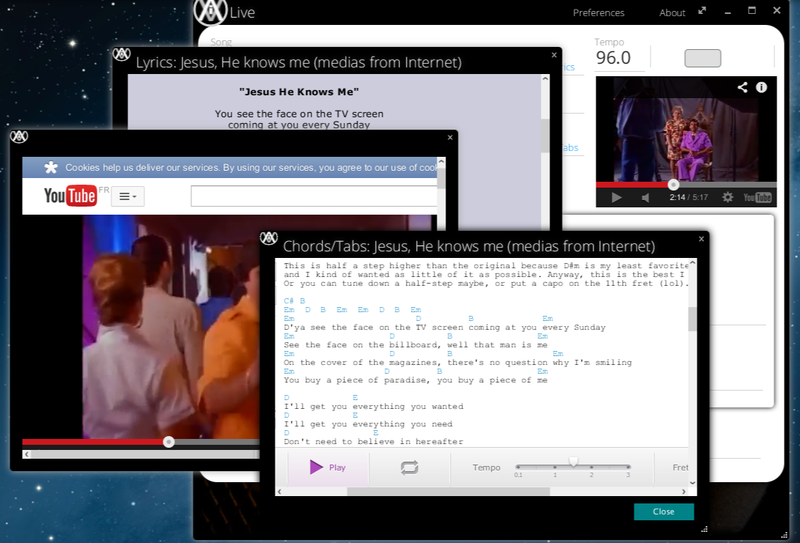 Here the “main” screen which displays all details of the Song. Basically, each column of a song row in the original Excel file is bound to a field of this screen. This is a bidirectional binding, if you modify the text of a field in this screen, it will later be saved in the Excel file. If you have custom column in your playlist file you want to display, e.g. “Style”, you also can display this custom column in the 2 remaining fields by simply typing “Style” in the editable part. The media panel supports all audio files supported by JavaFX. It also supports URL, in this case a WebView will be used to render the media. I want to manage my own playlist file! 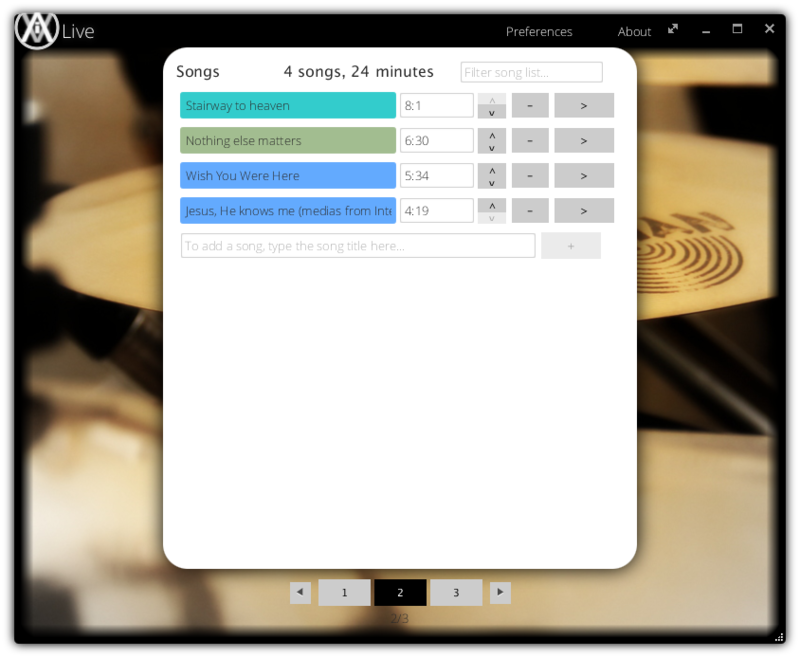 As a starter kit, in the first screen click on “save” button of the demo playlist, then a “save as” dialog will appear. Select a target location, and aLive will write all the data used for the demo (xls, mp3, tabs, custom screen sample). Now, feel free to edit you own based on these files. The demo file is also editable, and if you modify its content and come back to first screen or quit, the same “save as” dialog will be shown. This feature is not user friendly (yet), since you have to use an external tool to edit it. The principle is simple; all dynamic fields in the screen are linked to a column in the Excel file. This is done using the “JavaFX CSS Id” that points to a column name. Ok, let’s try… When saving the demo playlist folder from first screen, a “custom_Song_Screen” folder is created. Use this folder as an example of custom song screen. 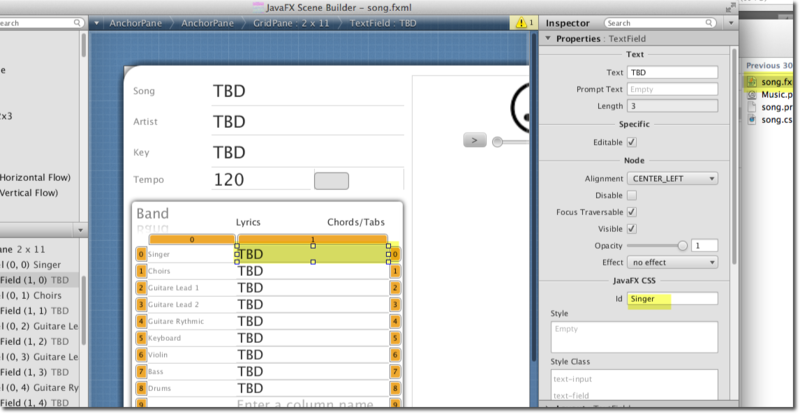 You will find the song.fxml file in it and you will need SceneBuilder 1.1 tool to edit it correctly. Once done, you can specify your own song screen through the Preferences dialog. 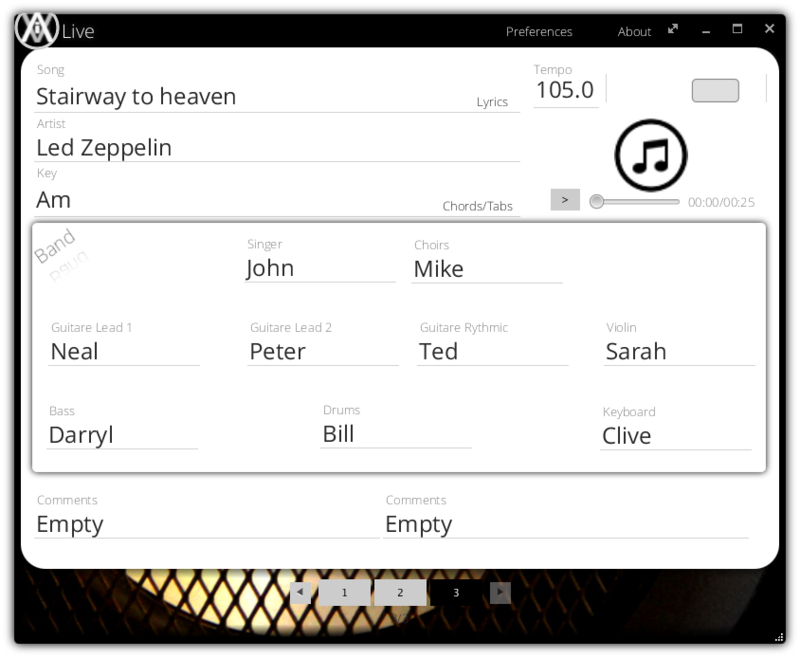 In future version, I’ll include part of the Scene Builder Kit API in order to directly edit the song screen in the aLive application without editing it with an external Developer tool. Upload aLive to the Apple AppStore. I’ll do a little break on that project, waiting for your feedbacks! Now, I will adapt all my other sub projects to Java8. 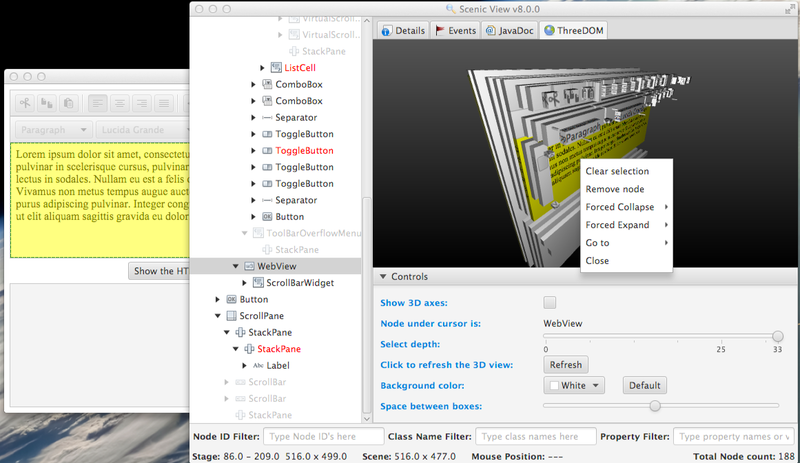 Once done, I’m excited to begin my brand new project based on 3D capabilities of JavaFX.